ValueSeal® is a NEW, ultra-thin, cost-effective sheet membrane for interior waterproofing of floors and walls. At 16 mils, it is Noble’s thinnest membrane. 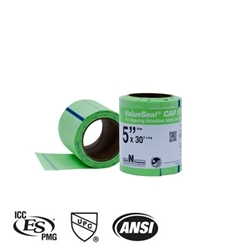 The Cap Strip is a 5" wide strip of ValueSeal material that can be used to seam joints and transitions. · Nominal thickness = 0.016"